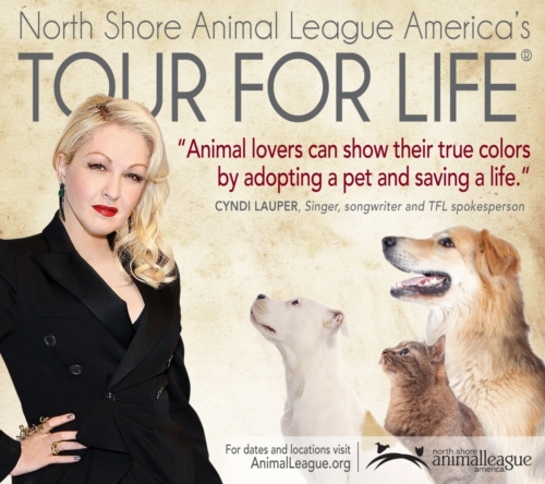 Cyndi Lauper is this year’s North Shore Animal League America's Tour For Life spokesperson. The charity launches its 12th annual Tour For Life today, March 14. Throughout the months of March and April, three Animal League Mobile Rescue and Adoption Units, in partnership with Purina ONE, will travel simultaneously across the US and partner with more than 100 shelter and rescue groups in 33 cities in 16 states to reinforce the importance of adoption and familiarize communities with their local shelters. Since its inception in 2001, and as the world’s largest mobile pet adoption event, Tour For Life has saved the lives of tens of thousands of animals across the country. For information on where to catch the tour, click here.